This is a list of the 114 ranked 11,000 foot peaks in Idaho. 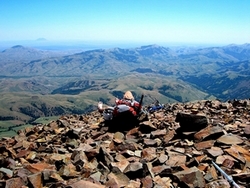 You may have heard of a few of these, but the majority are very obscure and seldom climbed. The peaks are sprinkled across seven different mountain ranges. None of them have any maintained trails to the top, most are a good challenging scramble, and a few require technical climbing skills. All are rewarding climbs in their own way, and several are all around Idaho classics. No one had ever climbed each and every one of the 11,000 foot tall mountains in Idaho until September 21, 2012 when my friends John Roache and George Reinier became the first to complete this amazing list of peaks. It took a ton of commitment and grit to accomplish this over a six year period. I’m proud to have climbed a handful of the mountains with these two Idaho peak bagging pioneers over the past several years. They were good enough to share the information below. Make sure to check out some of their great trip reports and fantastic photos. 13 "Brocky Peak" 11,839' 09/13/09 Wes's Descent Pat's "Brocky"
15 "Altair Peak" 11,825' 06/13/10 Bellas CG Pat's "Altair-Death by Postholing"
22 Ryan Peak 11,714' 11/04/07 Big Wood, N Fk Pat's "Conditions"
23 "Angels Perch" 11,687' 08/28/09 Wildhorse Pat's "Off Route - Angel's Perch"
25 Kent Peak 11,664' 05/27/07 Big Wood, N Fk Pat's "Kent"
26 Cobb Peak 11,650' 06/28/08 06/18/05 W. Ridge Pat's "Long Way"
27 "Gabriel's Horn" 11,641' 08/20/08 NW Ridge & W Face Pat's "August Road Trip"
34 "The Riddler" 11,580' 07/08/12 Pass Ck Pat's "The Riddler"
41 "Calkens Peak" 11,500' 08/21/07 Traversed from WCP 10 Pat's "WCP-10"
42 "The Moat" 11,477' 06/18/11 Upper Cedar Pat's "Peak 11,477"
49 Big Creek Peak 11,350' 05/16/09 Traversed from Flatiron Pat's "Big Creek Peak & Flatiron"
50 "D.O. Lee Peak" 11,342' 08/20/07 Traversed from WCP 9 Pat's "WCP-10"
51 "Limestone Mountain" 11,332' 08/15/10 Loristica C.G. Pat's "Limestone Mountain"
52 Invisible Mountain 11,330' 04/25/10 S Ridge Pat's "Invisible & Sheepshead"
64 "Sheephead Peak" 11,276' 04/25/10 Traversed from Invisible Pat's "Invisible & Sheepshead"
65 Redbird Mountain 11,273' 07/24/10 Traversed from Shelly Pat's "Lime Mountain campout"
66 "Little Diamond Peak" 11,272' 08/18/08 Traversed from Nicholson Pat's "August Road Trip"
71 Cabin Mountain 11,244' 07/25/10 Traversed from Lime Pat's "Lime Mountain campout"
74 "Perkins Peak" 11,220' 06/07/09 NF Big Lost Pat's "Snuck One In Yesterday"
75 "Shoshone John Peak" 11,212' 07/08/12 Traversed from Big Boy Pat's "The Riddler"
81 Lime Mountain 11,179' 07/25/10 Traversed from Redbird Pat's "Lime Mountain campout"
89 Silver Peak 11,112' 05/31/09 05/27/07 Silver Ck Pat's "Another Great Adventure..."
92 "WCP 10" 11,102' 08/21/07 Sheep Lake Saddle Pat's "WCP-10"
93 "True Grit" 11,100' 07/09/11 Dry Ck Pat's "Exploring Mount Doom"
95 "Gooseberry Peak" 11,090' 10/17/10 Metaxi E. Buttress Pat's "The Pahsimeroi Front"
99 "North Twin" 11,081' 05/15/10 Elbow Canyon Pat's "The Twins"
107 "Boulder Basin Peak" 11,041' 05/31/09 05/27/07 Traversed from Silver Pat's "Another Great Adventure..."
113 Flatiron Mountain 11,019' 05/16/09 Big Ck CG Pat's "Big Creek Peak & Flatiron"
Peak names listed in quotations are unofficial names. Many of these names are widely accepted, others are just nicknames.